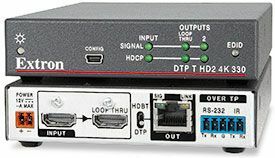 Extron Electronics has introduced the DTP T HD2 4K 230 and DTP T HD2 4K 330, transmitters for sending HDMI with embedded audio, and bidirectional RS-232 and IR signals over a shielded CATx cable to Extron DTP-enabled products. The DTP T HD2 4K 230 extends signals up to 230 feet (70 meters), while the DTP T HD2 4K 330 extends signals up to 330 feet (100 meters). Both models provide one HDMI input with loop-through to support local monitoring of digital video, and one DTP output. They support video signals at resolutions up to 4K, including 1080p/60 Deep Color. The transmitters offer many features such as EDID Minder, Key Minder, bidirectional RS-232 and IR pass-through for remote AV device control, and compatibility with HDBaseT-enabled devices. The compact enclosure size and remote power capability make the DTP T HD2 4K models ideal for discreet placement. The Extron DTP T HD2 4K 330 transmitter. "These new 4K DTP transmitters provide a robust feature set and reliable signal transmission over shielded twisted pair cable," said Casey Hall, vice president of sales and marketing for Extron. "They are ideal for accommodating a range of applications that must support a local monitor support at a lectern or table, in addition to video signal extension to a main display. "The DTP T HD2 4K 230 and DTP T HD2 4K 330 offer several integrator-friendly features such as a buffered HDMI input loop-through for local monitor support or system expansion. They also provide automatic input equalization which conditions incoming HDMI signals to compensate for signal loss over long input cables. Automatic color bit depth management based on the display EDID prevents color compatibility conflicts between the source and display. The transmitters can be remotely powered by Extron DTP-enabled products over the twisted pair cable. In addition, the DTP T HD2 4K 230 and DTP T HD2 4K 330 offer an HDBaseT output mode that is compatible with any HDBaseT-enabled display.